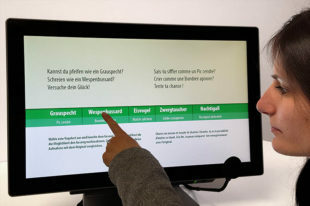 With this interactive display, visitors can experience and imitate all the various tweets, whistles and trills audible in forests and fields. What is, for example, the sound of the European honey buzzard? 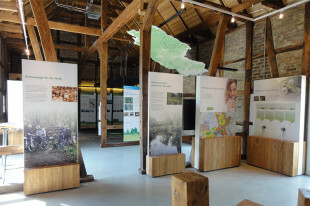 Visitors learn that each bird species has its own, unique type of call. Some sound magical and sweet, others rather irritating or comical. The concrete aim is for the user to imitate the original bird call as closely as possible. 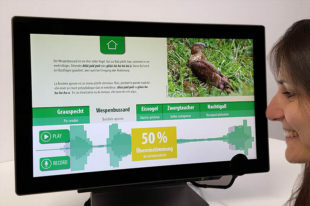 On a touchscreen, visitors first select the desired bird species and listen to its call. Then they try to imitate what they heard through whistling or singing, being recorded via an integrated microphone. An automatic comparison of the recording with the original call determines the degree of the match, which is then visually displayed onscreen as a percentage. As an entertaining, interactive display, bird karaoke is suitable for children, adolescents and adults alike. We are also happy to develop individual versions for other animal calls, e.g. the croaking of different frog species.